My earliest experience of time and space was during long summer days spent as a young child in my grandparents' back garden. There was a big lawn, a greenhouse and a vegetable patch beyond. The garden was rectangular. I gained my infant sense of distance, direction, speed, acceleration - and hence, time - while moving from one favourite little niche to another as they basked in the summer sun speck­led by the shadows of the fluttering beech and sycamore leaves. It was a small and relatively flat world that ended abruptly at the garden fence. As I became a little older, I gained more of a sense of the world beyond. I remem­ber the "epic" shopping trips into the centre of Manchester on which I was taken with my mother and grandparents during the dark times of World War II. I was too young to be aware of the War. I had never known anything else. What impacted me was the enormity of this world beyond the back garden. Nevertheless, this bigger world worked by the same rules. Although the bus went further and faster, it moved in essentially the same way that I toddled. The laws of motion were conserved. Soon, I reached the age at which I, like everybody else, ac­quired the mental power of abstraction. I could, mentally, place things into categories and abstract properties or be­haviours that were common to different things I saw and experienced in the world. I noticed, for instance, that the walls of the rooms in my grandparents' house were vertical. I saw that some were at right-angles to each other while others were parallel. The floor and ceiling were horizontal but at different levels. This practical observational experi­ence facilitated my perception of the X, Y and Z axes of Eu­clidean geometry. Later, I gained the ability to perceive the idea of rotation also with regard to these 3 mutually indep­endent axes. For me, time is something that flows. It is a flow, which can never be stopped. It cannot even be paused temporarily. It is an unvarying flow. It does not fluctuate. It never wavers. It flows linearly along a mysterious indivisible continuum. In other words, it flows straight. Unlike space, it cannot be looped. Events may repeat. But they are strictly different successive events. Time itself never goes in a circle. There is no such thing as an orbit in time. Like movement through space, the flow of time appears to have a rate, analogous to velocity. Its rate seems to be constant, irrespective of what I am doing. For me, time passes at the same rate whether I am moving, or whether I am stationary, relative to other things. It is as if I, and indeed everything else, were moving at a constant rate through time, relative to the same elusive absolute. When I am busy, a long time seems short. It goes by in a flash. When I am idle or bored, a short time feels long: it seems to drag. Nonetheless, I can distinguish, perceptually, between this subjective rate of flow of time, on the one hand, and the constant objective rate, on the other hand, at which I perceive time to be really flowing. Science's treatment of time is at odds with my perception of it. Science divides time into a sequence of moments. A moment is an extremely short lapse or period of time δt. Any given period of time, t, is the sum of an infinite number of moments of time δt, where the amount of time δt approaches no time at all. Notwithstanding, what we think of as a period of time isn't really time. Time is a flow, which cannot be stopped, frozen or even paused. Consequently, the notion we call a period of time t must, in reality, be the solution to the integral shown on the left. The variable of this integral is the reality we perceive and experience as passing (or flowing) time. The constant is the proportional relationship between the period of time t and time-flow . is to the flow of time what the speed of light c is to space. Its units would be seconds per unit , although I think all physical units ought to be redefined to make dimensionless. What I experience as the passing (or flowing) of time seems to be so fundamental that my mind finds it impossible to get a proper grip on. This is why I have used an invented symbol to represent it. I am well persuaded that the flow of time must indeed be the ultimate underpinning of all existence. But here I must be cautious. I must be aware that all I can know about the flow of time is that it is something I experience. It is something which takes place within my consciousness. What, from the outside world, really invokes this experience may be something quite bland by comparison. Indeed, the experience of the flow of time may be somewhat like the experience of colour. The colours of a flower garden are, in reality, differentiated by nothing more enchanting than differences in the frequencies of vibration of the electromagnetic waves reflected by the flowers. The first echelon of existence that my mind is able to get a handle on is the solution t to the above integral. This is what is known as a period of time, which can be measured in years, months, weeks, days, minutes and seconds. But a period of time is not an objective reality. It is merely an artificial construct, which doesn't exist outside the conscious mind. And it only exists there by virtue of the fact that the human mind has a memory. Thus, a period of time t is not time at all. It is, instead, what I perceive as a time off-set between two separate time streams. This, as I shall later try to explain, seems to me to be what space really is. From what I can glean, science does not address the nature of time as a constant unceasing flow of anything. It simply considers periods of time. But even a period of time is difficult to represent directly. For this reason, science tries to represent a period of time by drawing an analogy with an amount of space, which seems to be somewhat more tangible than a period of time. So science represents an amount (or period) of time by an amount (or length) of space. Science postulates that reality is 4-dimensional, comprising 3 space dimensions and 1 of time. 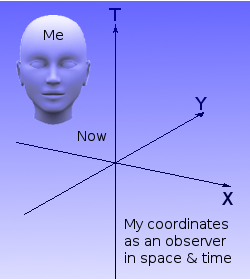 The coordinate origin (the quadruple zero point at which all the 4 axes intersect) is where I, as a relativistic observer, am permanently located. It is the apex of what is termed my event-horizon. It is from here that I observe my universe. This so-called frame of reference travels with me always on my life-long journey through space-time. It's impossible to represent diagrammat­ically the 4-dimensions of space­time in a way that can be humanly visualized. Science there­fore cuts out one of the space dimensions and uses it to represent the time dimension. Thus, 3-dimensional space becomes represented by a 2-dimensional plane. To try to get a tangible view of how mainstream science represents space-time, I imagine myself as an unperturbed generic object in free space, which is capable of conscious observation. By unperturbed I mean that I, as a body, am not being acted upon by any deliberate external force. In this relaxed or neutral state, other objects in the universe are moving relative to me. Furthermore, when on any course other than a direct collision course, an object approaches me at a decelerating rate, which is extremely non-linear, reaches a point of closest approach and then accel­erates away from me at a decreasing rate, which again, is extremely non-linear. Furthermore, if I make a close encounter with a body massive enough to exert a substantial gravitational influence, I not only undergo an acceleration followed by a deceleration but also end up travelling on a different absolute heading within the universe. But what exactly is this notion of motion? What is it that I per­ceive as my velocity or acceleration relative to another object? Science perceives it as a flow of (or through) space s with respect to time t. It is a flow, which may be linear or have many orders of non-linearity, with respect to a conventionally decided standard measure of time. I can have considerable control over my motion through space. I have absolutely no control over my motion through time. I never have the sensation of accelerating through time, but I do have the feeling of being passively conveyed through it at a constant rate. This fundamental difference between my experiences of time and space creates for me a conceptual problem with this 4-dimensional representation, where time is simply an additional dimension of exactly the same kind as the other three space dimensions. Within the coordinate system of my 4-dimensional frame of reference, the negative direction along my T-axis represents measured amounts of time into my past while the positive direction along my T-axis represents measurable amounts of time into my future. The problem is that I perceive my "now" as not being stationary but as moving relentlessly into my future at a constant rate. After all, even if I do nothing and go nowhere, I still get older. So, how do I represent this perceived motion along the T-axis in the above diagram? I can only conclude that science must perceive it as a flow of time t with respect to time t. How else can the mathematics of science represent a flow of time? But this is clearly a nonsense. I think that this conceptual problem arises because of the way time is represented in the 4-dimensional frame of reference. An amount of time is represented as a distance along a line. A line is perceived to comprise an infinite number of infinitely small points. Even the structure of language itself embodies the notion of a length of time. This gives rise to the notion of a moment as a point in time, which can be expressed as being a certain measured distance away from "now". My intuition is that I only have a sense of time because my consciousness is receiv­ing a continuous stream of information, via my bodily senses, about events taking place in the universe outside of me. Apart from my immediate surroundings, this continuous stream of information from my universe is carried to me by electro­magnetic radiation, which purportedly travels through space at a constant velocity, generally denoted by c. Consequently, whatever event takes place in whatever loca­tion within the universe, it can only affect me when its influence, travelling at velo­city c, reaches me. 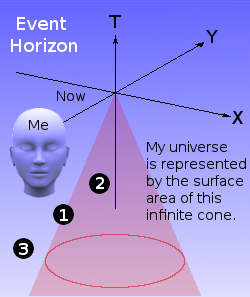 Depicted within science's view of 4-dimensional space-time, all events, whose influence can aff­ect me, at the moment we call now, must lie on the infinitely thin surface of the infinite red cone shown in the adjacent diagram. Such an event is indicated by the figure (1). An event inside the cone (2) happened too close to me for me to be affected by it now. Its influence passed by my present position sometime in the past and is currently travelling away from me. I may have been affected by it in the past, so long as its in­fluence passed my location after I was born. An event outside the cone (3) happened too far away from me for its influence to have yet rea­ched my current location. I could be affected by it in the future if I am still alive when its effect reaches me. It is not difficult to analogize these successive cones as successive frames of a film (motion picture) of my visible universe. But this notion of a film is dangerous. It re­quires only one small step of erroneous extrapolation to suppose that these suc­cessive frames of view have permanent existences of their own, as do the frames of a real movie. Hence the notion that the whole of one's past and future is indelibly etched upon successive conical slivers of the fabric of space-time. If indeed all my past and future be already inscribed within this 4-dimensional frame of space-time, then my innate sense of free-will is an illusion. I am inexorably con­strained to decide, in every small detail, what has already been predetermined that I should decide. I do not take thought and decide. My mind is no more than a gram­ophone needle following its inflexible groove in the vinyl of eternity. But this is completely contrary to my perception. I think and decide. My life is full of decisions, which I make every day. Of course, any decision I make is only meaning­ful if I have the power to expedite it. If I decide to blow up the sun, the decision is futile because I do not have the power to blow up the sun. Nevertheless, I find that, within a certain limited sub-domain of reality, I definitely am able to exercise free-will. A point in time cannot exist because time cannot be stopped. Time is a relentless continuum of flow. I therefore find no reason to suppose that the future be already determined. Furthermore, I find no reason to believe that the past remains in ex­istence. It has body solely as representative neural patterns within the brains of human beings, aided and extended by representative sounds and images borne within artificial recording media. The only truth in this regard, for which I can conscientiously vouch, is that I observe my visible universe to be in a continuous state of change. And it is this continuous state of change - this continuous flow of new information arriving into my conscious view - which gives me my notion of the passing of time. However, I think there is more to the perception of time than simply change. I think the perception of time comes from the subconscious comparing of one source of change with another. It is a comparison. More specifically, it is a comparison between a subject change and a reference change. From birth, my mind has been receiving a regular rhy­thm of change. It is the cycle of day and night. I sense this both as light by my eyes and radiant heat by my skin. As the day progresses from dawn to dusk, the strength, colour signature and angle of the daylight are in a continual state of change. Though a day may seem long, the angle, intensity and spectrum of the daylight progresses at a perceptible pace. 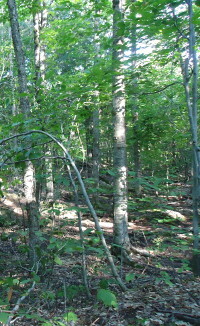 I have stood in the forest watching the dappled patterns of the sunshine as they move across the floor, climbing, first down, then up the trees. It is this, I am certain, which invokes my sense of time as a continuum of flow. Clocks may provide an abstract precision for measuring time numerically. But my conscious sense of the flowing of time comes from my life-long imm­ersion in this natural terrestrial environment with its relentless waxing and waning of the daylight. My perception of time is thus a perception of the relationship between what is and what was, even though what was only has existence in my memory. Notwith­standing, what was and what is are, of themselves, largely irrelevant. It is the movement or transition from what was to what is that forms the essence of what I perceive. This is evinced by music. In a musical phrase, the individual notes in mutual isolation convey no sense of harmony. It is only when they are sounded in the appropriate sequence, separated by multi­ples of a real or implicit metronomic interval, that I experience an instance of the auditory beauty called music. Music thus invokes an experience of movement through time, which is not dependent on a corresponding movement through space. On the other hand, I have a firm perceptual conviction that I cannot move through space without also moving through time. I would go so far as to say that any move­ment I make through space is a movement through time that is additional to that which I experience while not moving through space. In other words, I am forever involuntarily moving through time. However, if I also move through space, I am thereby necessarily making an additional movement through time. The universe is not instantaneously connected. A change in one place in the universe can only affect another place in the universe when the effect of the change has had time to reach that other place. An effect can only disperse from its origin to other places at the speed of light. In the triangle on the right, I can only see what He has done 4 μs (microseconds) after he has done it. I can only see what She has done 5 μs after she has done it. He can only see what She has done 3 μs after She has done it and vice versa. They can only see what I have done 4 and 5 μs respectively after I've done it. If I walk the 1·2 km to where He is, I effectively change my position in time by 4 μs. 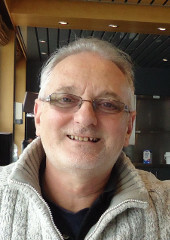 However, while doing so, I am also still travelling through time normally, in the sense that I am still getting older. It is as if I am on a moving conveyor belt of time and I have walked along this conveyor belt to a place 4μs different from where I was before. Nevertheless, information and effects appear always to be drawn towards me, at a steady rate, from every direction in 3-dimensional space. I am thus per­su­aded that time, like space, must be 3-dimensional, not one-dimensional as in the representation proposed by conventional relativity theory. I perceive my consciousness to be stationary, with the conveyor belt of time flowing into it from every direction in space, disappearing into an apparent singularity at the point where I am. But where does it go from there? Does it emerge into unseen dim­ensions inside the point-singularity? I can never know. The conveyor belt of time travels at the ulti­mate velocity, c. Faster than this, no object, inform­ation or influence can travel. Nothing can therefore run back against the conveyor belt fast enough to out-pace it and thereby emerge from the singula­rity at the centre of my consciousness. The rate, at which time flows in from the 3 dimensions of space to the point of my consciousness, seems to be a constant, c. It may not be thus. But this is how, fallibly or not, I perceive it to be. I am thus persuaded that my conscious sense or illusion of the rate of the passing of time is invoked by the continuous arrival of infor­mation on the conveyor belt of time, which is travelling radially inwards towards me from all directions in space at velocity c.
As I sit here, unperturbed within the universe, I am stationary with respect to some things and moving at an extremely wide range of velocities with respect to others. In fact, stationary is merely a special case of moving. It is simply zero relative velocity. It is as if, in any given direction, the relative velocity, v, between me and another object can be anywhere in the range −c < v < +c. Yet I sense that all the relative velocities, that I have with respect to other objects in the universe, have no effect whatsoever on the rate at which the conveyor belt of time flows into the point-singularity of my consciousness. Relative velocity in free space thus seems to be independent of the rate at which time flows, even though I see both of them as flowing within the same 3 dimen­sions. It is as if the spherical inward radial flow of my conveyor belt of time is part of my very being. It moves with me as a constant unchanging companion wherever I go. It is my universe. It is the underlying essence of infinite reach, which presents to me my view of all external reality. It is my one and only true frame of reference. NOTE: The independence of v and c may well stem from the fact that c is not really a velocity. A velocity is a vector. It therefore necessarily has a magnitude which pertains to a single direction in space. The quantity c, on the other hand, is not a velocity because it pertains simultaneously to all directions in space. It is therefore not a velocity but a rate of conver­gence. Convergence is spherically symmetrical: velocity is not. Velocity is as spherically asymmetrical as it is possible to be. Where does this leave my notion of space? Can I express the idea of spatial separation in terms of time? Consider the spatial separation between Him and Her in the adjacent diagram. She is 0·9km away from him in one direction (call it the positive direction). He is 0·9km away from her in the opposite direction (which consequently must be the negative direction). Thus distance is bipolar. It can have a positive direction and a negative direction, although which direction is considered to be negative and which direction is considered to be positive is entirely arbitrary. On the other hand, he sees her as she was 3μs in the (his) past and she sees him as he was 3μs in the (her) past. Thus time is monopolar. It cannot progress in a negative direction. In the diagram on the left, the vert­ical direction represents time, in the same way that mainstream physics does in its representation of 4-dim­ensional space-time. This well illust­rates the point that he can only ever see her (as shown by the dark­er magenta-coloured head) as she was 3μs into his past. 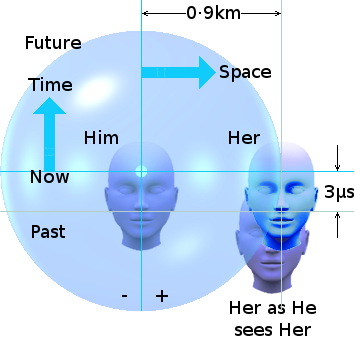 There is no reason why the Him and Her heads cannot be interchanged, with her head in the middle and his head + its past image on the left edge of the diagram instead of the right. Their vertical placings, however, re­main the same. They do not rever­se like spatial separation. She also sees him as he was 3μs in her past. The upshot is that, although He may be considered to be following Her, or She foll­owing Him, in space; nobody can ever be ahead of, or behind, anybody else in time. Time imposes no ranking. In time, we are all equal and cannot be otherwise. She being 0·9km away from Him in space, effectively off-sets Her by −3μs along His conveyor belt of time. The negative sign signifies that the off-set is into the past. This −3μs has the sense of being a static measurement of time in the same sense that 0·9km represents a static (or fixed) distance. I think that human beings have come to perceive these as the fundamental measurements of time and space because this static situation is dominant within the physical environment within which our human brain has developed its spatial and temporal perceptions. My feeling is that the fundament is not time-offset (as measurable in seconds) but is the flow of time. This flow of time is so fundamental that it is very difficult to grasp mentally. Time-flow is to time what velocity - or, more correctly, rate of conver­gence - is to distance. If He and She are co-located (strictly an impossibility but it illustrates the point) they go with the flow of time together in the same way as two asteroids hurtling through space side by side. If She is 0·9km distant from Him, they are both hurtling through time at the same rate, but off-set from each other by −3μs. She is in one direction in space from His point of view and He is in the opposite direction in space from Her point of view. But each is off-set from the other in the same direction as regards time. A time offset cannot exist as a separation between two so-called points in time. It can only exist as the spatial separation of two time-flows. Space (distance) is equi­v­alent to a time-offset. So if time did not flow there would be no space. Velocity is the rate at which this spatial separation (or time-flow off-set) changes. My perception is that the sight of all that I see is brought to my consciousness upon my conveyor belt of time. It seems to me that it is this conveyor belt of time which brings light to my eyes. According to my best understanding, science currently believes that light travels in the embodiment of photons. These so-called particles of light travel at the speed of light, each bearing a specific quantum of energy. But science also believes that to accelerate anything to the speed of light relative to its source would require an infinite amount of energy. So how does a photon manage to attain the speed of light from a standing start when it is emitted from its source? I don't see how it can. On the other hand, suppose the atom that emits the light does not emit a particle at all but, instead, simply etches a transverse crease within the passing fabric of the conveyor belt of time. I thus imagine my conveyor belt of time to be a 3-dimensional version of the moving paper of an electro-mechanical chart recorder upon which the oscillating pen inscribes an ink trace. This crease naturally moves onwards, upon the conveyor belt of time, away from the atom at the speed of light, without the need for any accelerative energy. The crease in the temporal fabric effectively stores the quantum of energy inscribed there by the atom. This idea is consistent with the well observed scientific phenomenon known as the Döppler effect of light. Suppose my velocity, relative to a green light-source, is zero (as in the middle illustration on the left). I see green light because the source is writing alternating transverse etches on to my conveyor belt of time at the frequency f of green light, as it passes the source at velocity c. On arrival at my eyes, the transverse etchings therefore alternate at frequency f as they enter the singularity at my centre of consciousness. If I am moving away from the green light-source at velocity v (as shown on the left of the illustration on the left), my conveyor belt moves past the source at velocity c+v. The transverse creases, written at frequency f, will thus be inscribed further apart. The result is that, as the conveyor belt of time passes into the singularity at my point of observation, the creases will pass in at a reduced frequency f × c/(c+v). This will cause the green light-source to appear to me as red light. 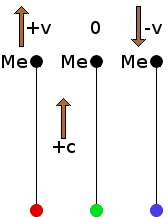 If, on the other hand, I am moving towards the green light-source at velocity v (as shown on the right of the above illustration), my conveyor belt moves past the source at velocity c−v. The transverse creases, written at frequency f, will thus be inscribed closer to each other. The result is that, as the conveyor belt of time passes into the singu­larity at my point of observation, the creases will pass in at an increased frequency f × c/(c−v). This will cause the green light-source to appear to me as blue light. The expression c+v, used above where the obser­ver is receding from the light source, does not im­ply that anything exceeds the speed of light c. The etchings on my conveyor belt of time, once etched, always move at the speed c of the conveyor belt. If an observer at the light-source sees the trace of the light-pulse as shown on the right, the etching on my conveyor belt of time will be elongated horiz­ontally with respect to the stationary trace. Supp­ose the trace and the etching are aligned with each other at A. 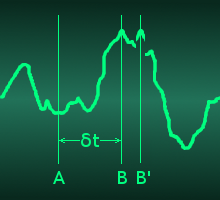 After time δt the amplitude is as shown at B. However, during the lapse δt, the conveyor belt itself has become off-set from the source by an amount vδt. Consequently, the etching of the point B amplitude upon my conveyor belt of time will appear an extra distance BB' along the conveyor belt's fabric. The change in light-amplitude from A to B' will therefore be conveyed to me more slowly than it was etched from A to B by the source. That is why I see red light and not the green light the source emitted. The closer I am to a light-source, the stronger I perceive its light to be. A greater proportion of the light emitted by the source is captured by my eyes. I propose that this is because the creases, etched by the light-source into my conveyor belt of time, occupy an increasing proportion of the surface area that my conveyor belt subtends at the light-source. This captured energy has been measured to be inversely proportional to the square of my distance from the light-source. However, I think it is better, conceptually, to say that this captured en­er­gy is inversely proportional to the spherical surface area subtended by my conveyor belt at the light-source. My notion of a personal conveyor belt of time bringing all information and effects to me from all parts of the universe seems, at first sight, to have a serious flaw. The universe would have to equip every other conscious observer with a similar person­al conveyor belt of time. This is evinced by the fact that each conscious observer sees the universe from a point of view which is, at least, slightly different from that of every other conscious observer. No two observers can occupy exactly the same position in space at the same time. Even more than this, it would seem that every infinitesimally small point in space would have to have its own individual conveyor belt of time. This is evinced by the fact that when I am in a closed room lit by a lamp, I see light, which clearly origin­ated from the lamp, reflected towards me from the walls of the room. Every point on the walls is etching light onto my conveyor belt of time. The light must somehow have travelled from the lamp to the walls before it could be etched onto my con­veyor belt of time at each point on the walls. Does each infinitesimally small point on the walls of the room have its own conveyor belt of time to bring to it the light from the lamp? What form would an infinitesimally-small point in 3-dimensional space take? Would it be a basic granular unit of space with the diameter of one Planck-length? If so, how would the exact demarcations between points be determined? Are these granular units real objects? Are they the elusive loops of Loop Quantum Gravity? Perhaps so. But there is another option for speculation. It may be that only reactive objects have their own conveyor belts of time. By reactive object I mean some kind of standing-wave structure like an atom, which has the ability to absorb or react to effects originating from other such objects. 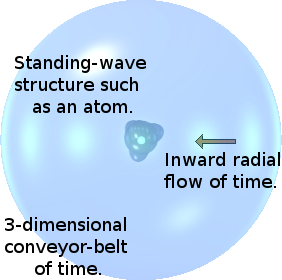 Thus perhaps each standing-wave structure in the universe has its own conveyor-belt of time continually flowing into it at the speed of light, c. So, atoms and per­haps other primary particles may, in essence, be time sinks. This view seems more plausible to me for reason that my consciousness relies on a photo-chemical mechanism to transduce, what arrives on my conveyor belt of time, into my conscious view. Thus is explained the light reflected from the walls of my room. Each light-reactive atom in the paint on the wall absorbs the light arriving on its conveyor belt of time from the lamp and then uses the energy therefrom to etch a new crease upon my conveyor belt of time, which duly arrives at my eyes a few nanoseconds later. The conveyor belt of time is also consistent with the observation that light disperses spherically in 3-dimensions from a source. Imagine a light-source surrounded by an astronomical number of light-sinks in every direction in 3-dimensional space. Each light-sink has its own conveyor belt of time continually flowing inwards. Any pulse of light, etched into this myriad of conveyor belts of time passing by it, will become dispersed in every direction in space, outwards from the light-source, at the speed of the conveyor belts, which is, in every case, c.
I briefly explored the possible existence of a complementary outgoing conveyor belt of time, which diverged, outwards from one's point of consciousness, into one's future event-horizon. However, I subsequently discarded this possibility due to its inherent inconsistencies with my overall perception of the universe. My foregoing thoughts on the perception of time lead me personally to the following speculative conclusion about its nature. I perceive time to flow. Notwithstanding, I think that the sense of the flow of time is an experience which is invoked by the unceasing arrival of new information. Consequently, I think that the constant and the variable in the adjacent integral must pertain to my experience of the flow of time rather than to the external objective reality which invokes that experience. I imagine the objective reality, which invokes the sense of the flow of time, as the flow of an underlying universal æther, which I have referred to as the conveyor belt of time. However, unlike the old concept of the luminiferous æther, this one only exists in a state of flow. I see this æther as the essence of existence. It is the fabric from which all else is formed. But it does not and cannot exist at rest. It flows continually at the speed of light, c, relative to all else. It flows continually, from the furthest reaches of space, into "singularities" at the centres of all stable standing-wave structures within the universe. I will not speculate as to the form or shape of this universe. Like all observers, I am part of it, so I can never put myself in a position to view it objectively. I can only view it as an observer looking outwards from his own unique position within it. As such, the universe appears to me as an unceasing stream of information and effects coming into my conscious view, as if borne upon an æthereal in-flow, conver­ging towards me symmetrically from all the direc­tions of 3-dimensional space. I see that others re­act to some of my actions. Consequently, I deduce that each of them must have a similar æthereal in-flow bearing information about me. My perceptions of time and space developed, within the neural networks of my brain, solely from experiences within my terrestrial environment. This environment is not a general one. It is, universally speaking, a special case. Its fundaments seem to be space (manifested as the static distance between things) and time (the delay involved in moving over a distance). 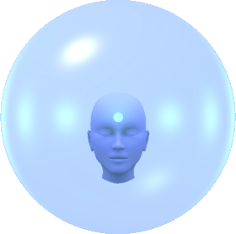 If, however, by means of a thought experi­ment, I transport myself beyond the terrestrial environment within which my per­ceptions were formed, the fundaments appear somewhat different. They appear to be essentially one order of time removed from my formative experiences. In outer space, stationary is simply a special case of relative motion. The basic state is where things are moving unperturbed relative to each other. That is, where all objects are moving free of external directional forces applied to their outer sur­faces. In this state, the fabric of time (the æther) appears not to exist. Consequ­ently, I perceive that it is relative velocity and not space (distance or separation) which is the fundamental separator of objects. For this reason, I would attribute relative velocity as a dimensionless ratio. This necessitates that notions like distance and acceleration be redefined against relative velocity. Consequently, I see relative velocity as a dimensionless ratio between zero and unity, being expressed as a fraction of the speed of light, c, which is the velocity at which the æther (the fabric of time) flows. Terrestrial velocities could be expressed in terms of a unit I call the nanocee, which is one thousand millionth of the speed of light. Thus 100 nanocees would correspond to just over 67 mph (108 kph) and 100 mph (161 kph) would correspond to 149 nanocees. The fabric of time (the æther) only seems to assert itself when my body is acceler­ated by an external force. This causes my æthereal conveyor belt of time to be­come forcibly warped (compressed in one direction and stretched in the opposite direction). The æthereal fabric resists acceleration by imparting what appears as an inertial reactance to the acceleration. For me, this composite view of the flow of the æther is evinced by the existence of gravity. A flow of any form of infinitely-compressible fabric into a point tends to establish and maintain a symmetry of flow towards that point. A vortex of water, sometimes seen where sea water meets river water, is a 2-dimensional example. If two such vortices come close to each other, they disturb each other's symmetry of flow. As a result, an apparent force seems to pull them together in an attempt to make them merge into a single vortex. Depending on initial conditions, they may fall straight towards each other or orbit each other before merging. The 3-dimensional vortex of the flow of the æther into all the atoms that make up a planet is very large. Thus it will tend to make the æthereal-flow vortex, formed by the atoms in my body, merge with it; hence gravity. An interesting corollary to this view of gravity is that it does away with the need for the notion we call mass, which I understand has always been a problem with the Standard Model of physics. 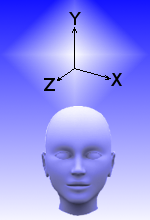 The 3-dimensionally symmetrical flow of the æther moves at the speed of light. Its spherical asymmetry, however, causes its density to change non-linearly evermore rapidly as it approaches the fuzzy singularity at its centre. On the surface of the Earth, its rate of change of density is extremely non-linear as it passes into the Earth's surface. The surface of the Earth thus accelerates my body upwards against the flow of the æther, creating an inertial reactance, which is my weight. My perception of time and space is, of course, significantly different from that of current mainstream science. But it is a framework of perception that works for me. And that is what makes it valid. I would not pretend that my framework of per­ception of time and space be in any way a tangible part of nature. It is simply a construct, within my mind, which helps me personally to understand it sufficiently to be able to navigate my way through life and philosophical thought. In this sense, it is just as valid as the 4-dimensional frame of reference, used by mainstream science. This too can never express or represent the true objective nature of time and space. It is merely an imperfect artificial framework constructed within the minds of physicists to aid their perception, which is necessarily fallible and, as such, forever susceptible to radical change. It is possible to conceive of other possible versions of the conveyor belt of time. Here I explore two that I subsequently discarded due to inherent incompatibilities with my overall perception of the universe. Notwithstanding, I think it is useful to cover them here to show that I have considered them. The principle of Ockham's Razor compels me to seek the simplest possible view. I therefore need to consider the notion of a single outgoing conveyor belt of time to replace the myriad incoming ones. Instead of the light being etched upon the myriad incoming conveyor belts of the astronomical num­ber of light sinks surrounding a light source, the light source itself has its own outgoing conveyor belt of time, upon which it etches its light-pulse. Each light-sink is thereby perturbed by the small splayed-out part of the light-pulse as it is trans­ported past the light-sink on the light-source's out­going conveyor. But there's a third option. Suppose that both exist. 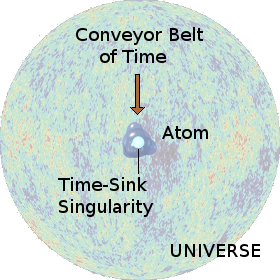 Suppose that every standing-wave structure in the universe has both an incoming conveyor belt of time and an outgoing conveyor belt of time. In this third view, each standing-wave structure in the universe is a centre of ex­change of a full-duplex (or two-way) time-flow. It is a point-singularity, which acts as both a source and a sink of time. Its incoming conveyor belt of time is the funda­mental flowing essence which is the substance of its past event-horizon. Its outgoing conveyor belt of time is the fundamental flowing essence which is the substance of its future event-horizon. Its incoming conveyor belt brings to it information from its past event horizon. Its outgoing conveyor belt takes information about it into its future event-horizon. The duplex flow of time is thus the fundamental essence that makes the universe a single linked communicable entity. I imagine this third view as being similar, in principle, to a balanced twin-wire transmission line feeding a dipole radio aerial. The conveyor belt of time is the trav­elling wave, which moves from the transmitter to the aerial at a constant speed (a little bit below the speed of light, c). The point-singularity into which it is flowing is the aerial. The standing-wave structure (atom) surrounding the singularity com­prises the reflected standing waves in the transmission line. The wave structure, which we perceive as the atom, is therefore a kind of standing wave pattern trap­ped between the incoming and outgoing conveyor belts of time. Thus, all stable microscopic structures in the universe are linked dynamically by what is, in effect, this duplex (incoming and outgoing) conveyor belt of time. I have pictured the incoming and outgoing conveyor belts of time as entering and leaving a point-singularity, which resides at the centre of a standing-wave structure. The strict notion of a point-singularity has always bothered me. For example, I have never felt comfortable with the idea of the big-bang birth of the universe starting from an infinitely small point-singularity. Consequently, rather than a point-singularity, I imagine the conveyor belts of time flowing into and out of a finite fuzzy singularity, within which different close-quarters terms within the conveyors' laws of motion dominate over the more general ones. Of course, no observer (information-sink) can see (or otherwise sense) anything within his future event-horizon. It is fundamentally inaccessible to him. He can only see and be affected by what is arriving at him from his past event-horizon. Yet he can send information to, and impose effects upon, observers inhabiting his future event-horizon. Thus, any observer - and indeed, any standing-wave structure in the universe - is, in effect, located at a singularity into which time flows and out of which it flows again. As an observer, I find myself led to the following idea. There are some phenomena which arrive at me exclusively upon my own personal incoming conveyor belt of time. There are other phenomena which perturb me as they pass by me on their respective sources' outgoing conveyor belts of time. There are yet other phenom­ena which somehow ride upon both their sources' outgoing conveyor belts and also on my incoming one. These three situations between them seem to give me good account of a lot of situations, which I previously found impossible to understand. 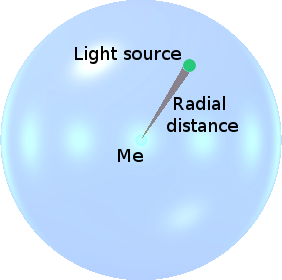 Consider the case of where I am observing a distant light-source, as depicted in the following illustration. The light-source on the left emits a pulse of light. This pulse then etches an energy crease onto the source's outgoing conveyor belt of time. By reason of its nature, the crease etched by the light-pulse also imprints itself on my incoming conveyor belt of time. 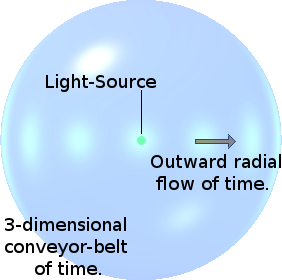 The outgoing conveyor tends to distribute the energy of the light-pulse over the surface area of an ever-expanding sphere. The incoming conveyor tends to concentrate the energy of the light-pulse into the area of a spherical cap, which gradually contracts towards zero area as it approaches me. An infinitely continuous interplay between the two conveyors would result in the light-pulse's energy first splaying outwards up to the half-way point and then effect­ively being gathered to a point as it reached its destination. Perhaps this framework of perception could plausibly explain how a photon - a wave-like disturbance - could deliver its energy point-to-point, yet also be subject to wave-like interference eff­ects. Imagine, for example that a pair of Young's slits were placed at the half-way point on the diagram. Perhaps the degree to which an electromagnetic pulse etches each conveyor varies with the pulse's frequency, or more precisely, its ramp gradient - how fast its polarity switches. Perhaps high-frequency pulses react much more, proportionally, with the observer's incoming conveyor belt, while low-frequency pulses react much more, proportionally, with the source's outgoing conveyor belt. This could explain why light appears to travel as particles while radio signals appear to travel as simple distributive waves. Of course, as established observation confirms, a photon starts its journey as a point-like particle and ends its journey as a point-like particle. Notwithstanding, as the above illustration shows, it can, during its journey, spread out as a wave struc­ture and contract back again to a point-like particle. It is fundamentally impossible to see what form a photon takes during flight. So nobody can know if and how a photon may change its form, shape or nature during its journey from source to observer. This means that both the source (origin) and the sink (destination) of a photon play a part in its transmittal across space. Apart from this, very little, if anything, else can be known about the point-to-point journey of a photon. For instance, a photon's point-to-point transit time - and hence the point-to-point speed of light - cannot be known. We can only ever measure the time for light to make a round trip from its source to a reflector and back again to its source. And who knows whether the photon which arrives back at the source on the return leg is indeed the same one that left it on the outbound leg. Notwithstanding, for reasons I shall cover in later essays - I will keep to the idea that there is only one conveyor belt of time and that it is incoming to each active object in the universe.